Davao City is located on the southern Philippine island of Mindanao. Samal island official name is the Island Garden City of Samal. We took a Speedboat from Davao, and within 20 minutes we arrived at the best 5 Star Luxury Hotel on the island, the Pearl Farm Beach Resort. After a really intense week working with the Honestum Est, Eesty Coin and Arcallia.com event tour we deserved few vacation days on the white sandy beach. Clear and warm blue water, a nice weather over 30°C a nice sunshine, green nature, birds singing and colourful geckos. This is paradise. Every day you can make water sports, gym, swimming, tennis, and sun baths, have good lunch, read books or just relax surrounded by white sand beach and blue lagoons. 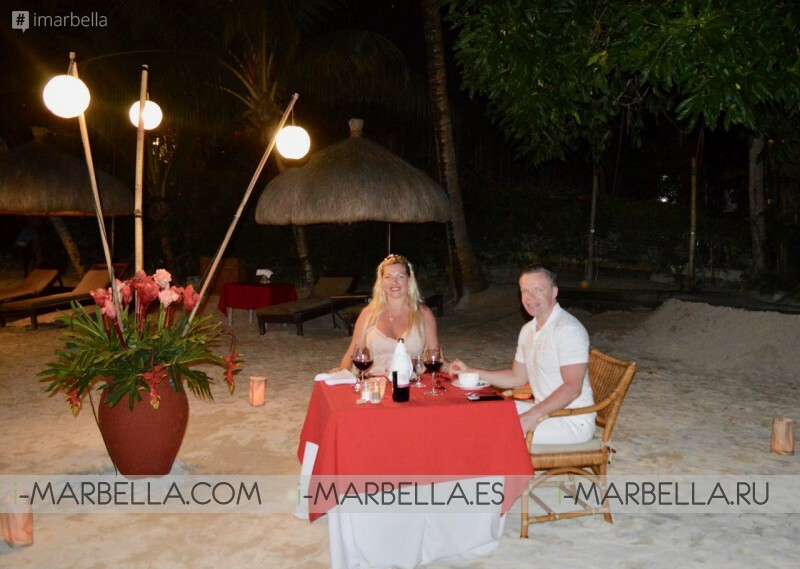 We were having a special romantic dinner on the beach with Philippine's food. A particular set up on the beach line 18 USD+. Food was cheap starting from 5 USD per course, yes we took lamb and beef for 20-22 USD, but it was still really cheap. A massage in the Spa costs 20 USD and food massage 15 USD. To this date I don't know about any other 5-star luxury resort with these prices. Usually, a massage is 120-150 USD 45-60 minutes. This resort is valued with its money, even more. Whole 4 days trip with a private speedboat, dinners, massage wine and the villa was all for 1092 EUR. This is the place I warmly recommend. First, you have to go From Manila to Davao city and then you get a shuttle bus from the airport. At the hotel, they have their own harbour mainland. Annika Urm is a businesswoman, journalist, international influencer, blogger, public speaker, the director of i-Marbella.com, and her job is to report emotional experiences and facts in the best possible way. Annika is a modern entrepreneur, a business lady of high standards and exquisite taste. Annika's incredible performance is best described by her numerous followers (more than 200,000.00 each month).